Davy Wotton has caught a lot of big trout in the past 30 years and wet fly fishing in the traditional style is one of the biggest reasons for his success. Listen and find out about Davy's techniques and how to master them. Wet fly fishing is probably the best way to get started for beginner anglers. Since it usually doesn’t require as much skill and practice compared to nymph and dry fly fishing, you will not only enjoy the experience but will take home the rewards as well. You might want to listen to our interview with Davy Wotton as he explains how wet fly fishing works. Davy’s career in the fly fishing world began in the 1960s as a professional fly tier. In the early ‘70s, he began writing fly fishing articles. Many of his fly patterns are currently produced commercially for the world market. 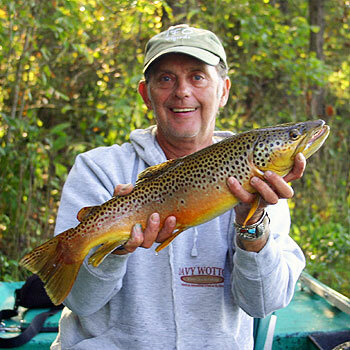 He is a consultant to many fly fishing organizations around the world. In the past five years, he has produced a number of shows, in conjunction with Fly Fish TV, for national networks. He has his own series of "How To" DVDs. Among his shows are Wet Fly Ways, Davy’s Favorite Flies, and The White River. Davy was recently awarded the USFW Director of Fisheries award, in in Atlanta, Georgia, for outstanding voluntary services towards Fisheries and Conservation for services rendered. He is also a popular speaker at fly fishing events around the country and hosts many other fly fishing activities during the year. A wet fly is designed to sink below the water surface. They are tied in different ways to represent larva, pupa, nymphs, drowned insects, baitfish, and other underwater prey. According to Davy, wet flies have some traditional structural values that belongs to a certain period of time. Wet flies differ from nymph flies in the sense that they are not directly tied to present anatomically a food source that those fish would generally see, whereas nymphs are generally impressionistic designs of invertebrate food sources. Wet flies can be used in place of nymphs. A lot of wet fly patterns and soft hackle patterns are as good, if not, more effective at times, most especially during those times that the fish are taking caddis pupa, in the stages of its emergence, or when it is sent in from the bed of the river to the surface. According to Davy, the fascinating thing about using wet flies is that you can copy those bugs but the method of fishing those flies would differ to how you fish the actual caddis pupa in the stages of emergence or as a winged insect. There are primarily five components of a wet fly – a tail, a body, a ribbon medium, a hackle, and a wing. However, not all flies incorporate all of these components. Sometimes they only contain two of these elements, or for other flies, they even incorporate more than these five components. Davy chooses wet flies based on what it is that he wants to do with it when he’s fishing. "What causes me to make those selections is based on many, many years of experience." He says that he knows this through watching fish behavior and what it is they are likely to eat in the manner which he wishes to present that fly. Wet flies don’t necessarily imitate the food source that the fish are feeding on. However, there is something about the characteristic of that fly which is based on its size, color, and the manner you present the fly to the fish that triggers the response from the fish. "Those fish either believe it to be a natural food source or it has taken it out of aggression." A wet fly should sink as soon at it lands on the surface of the water. If it doesn’t sink, then you should look into several factors such as the weight of the hook and the nature of materials that you’ve tied on that fly. "If you’re one of those guys that just wraps up a whole ton of dubbing on that body and it looks like a mouse, well, it isn’t going to sink very fast." Wet fly fishing is not all about necessarily using a dry line. Davy frequently uses lines that are intermediates or dry lines that have very short sections – around two or three feet – of intermediate tips. This enables you to get your flies down. Davy’s prefers a long rod for wet fly fishing. He says that short rods such as an 8-foot rod will make him handicapped and restricted to what he can do, whereas, if he uses a 10 or 11-foot rod, it will enable him to do things he cannot do with a short rod. "The longer the rod that you can comfortably handle, the more you are able to control and work those flies." The last thing you need when you’re wet fly fishing is a fast-action rod. First of all, you can’t animate those flies, and, secondly, you can fish easier with teams of flies. Davy’s final advice is to keep in mind that the fisheries that we often fish today have a lot of human presence. They see the techniques and the means that we’re trying to catch them, so they become educated – they are not gullible. Thus, a lot of techniques that are generally not deployed are often more effective. "Start to figure out stuff that you have never done before. It doesn’t matter whether you’re using different flies or different techniques. Just have some logical approach to what you do." To learn more abouit wet fly fishing techniques, listen to our full show with Davy Wotton.